Yesterday, Laura and I went hiking with some friends at South Fork, a popular spot on a cool Sabbath afternoon, to take the edge off of potluck before dinner. A mile or two down the trail, the people walking in front of us (distant relates of Laura) started carrying on and jumping around, almost to the point of dancing. We thought that strange behavior for middle-aged Adventists, until we discovered the reason. 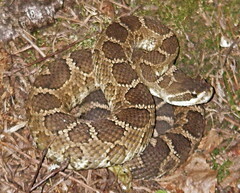 They had stepped over a rattlesnake lying in the middle of the trail. On that hike we also saw Laura Gren with Conrad's family, I don't know if she saw the snake or not. By the way, the snake is now a good snake. But I took a picture first. Along the way, we also smelled dead salmon that swam up from the ocean to deposit caviar. I took a picture of him too. It was amazing to all of us that Salmon made it up that far. 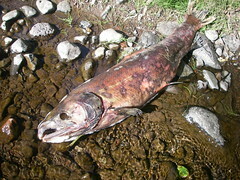 It may have something to do with limited Salmon fishing this year. We've never seen salmon there before.